Bangs are amazing with various hairstyles regardless of the length, color or hair thickness. So it’s always a good idea to consider them as a part of an innovative haircut. And when you’re kind of tired of your ordinary hairstyle, you can always make the highlight on the bangs and revitalize your look with a youthful touch. The options of getting creative with bangs are endless, so you’d better find the one that fits your amazing personality. In case you lack imagination, get inspired from these creative and stylish ways of wearing and styling bangs! Smiley bangs are one of the most risky styles, which are just a few centimeters above the brows. Those usually do not fit every face shape, so you need to be careful before stopping on this choice. The style is mostly known as a doll style look. Recently the style is tuned with vivacious hair color options, such as blue and pink. Smiley bangs tend to highlight the cheekbones and your eyebrows. The style makes the look more serious and ideally fits for thick and straight hair. So you don’t really need to spend too much time on the styling. Short blunt bangs will be great with various updos and will look even more enchanting if combined with cat-eye makeup. If you don’t have plenty of time to spend on styling your bangs, simply braid them! Braiding bangs is an amazing solution to remove the hair from your face, at the same time to look fresh and unique. The style of the braid depends on your own technical skills of making braids: the more complicated, the more fun! 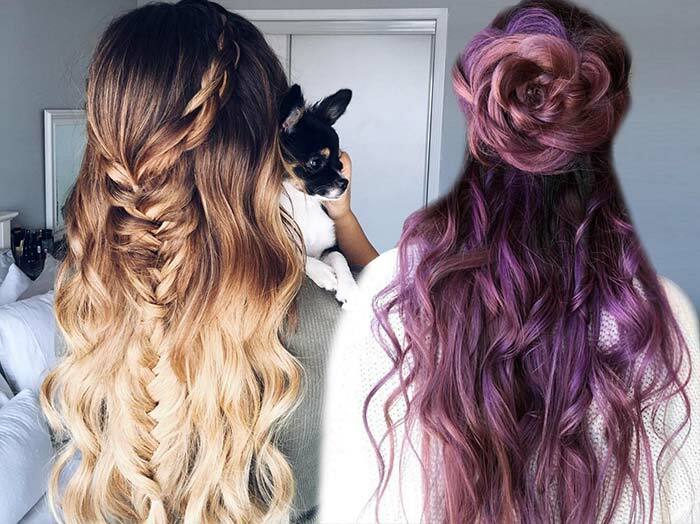 Planning of adding more color to your hair or at least to some strands? Well, why not get risky and add it only to your bangs? The more color you add, the more highlighted your hairstyle will be. Bright colors will look especially appealing and juicy for the summer season. This will help you keep being stylish even when having bad hair days. The trend gets even more funkalicious with bright fluorescent colors. Imagine you on a motorcycle enjoying the fun of the ride in one of the sunny southern islands. If this is exactly how you want to spend your vacation, rock style bangs are always a great style to borrow. Those are short, can be easily styled with the help of various styling products and tools. Moreover, rock bangs are usually easy to keep in the perfect form for the entire day. Heavy bangs look amazing, when combined with layered hair. Such bangs make every hairstyle more aristocratic and sophisticated. However, be careful if you have curly hair, as short heavy bangs tend to easily get curly and spoil the classy style you wanted to create. Piecey bangs are the best solution for women with thin hair. They tend to make the look more innocent and charming, transforming you into a delicate lady in a few minutes. Wear a bright lipstick to attract the attention on your lips and your gorgeous look is guaranteed! These bangs are light and do not need extra styling throughout the day. If you cut bangs a bit longer, you can always remove those from the face to one of the sides. The style will be majestic with classical updos. The length of the bangs should not be exceeding the mid-length of your ears. Here you can work to keep some volume, adding styling gel to the side bangs before styling them. Pompadour style bangs are definitely not an everyday style, but if the plans include visiting a rock party or just any other type of festival with lots of crazy and fun guests, then those are just the perfect choice. Vintage bangs look especially awesome when matched with the perfect girlish outfit, like a retro-style dress combined with a denim jacket. To get more into the style, you can pull your hair into a ponytail and accessorize it with a ribbon. Get a pair of vintage earrings from the nearby flea market and you are done! Hardly there exists any girl, who hasn’t at least once in her life experienced with bangs! And if you are really that unique fashioniser, who has never dared to wear bangs, it’s definitely high time to follow your inner stylist and inject a bit of fun into your monotonous look!